ON THE morning of September 24, 1980, Rex King – the general factotum of Led Zeppelin drummer John Bonham – picked up his boss and headed for the home of the band’s guitarist Jimmy Page in Windsor. But Bonham, known as Bonzo, was having a crisis of confidence about his musical abilities. While he had kicked his heroin habit and taken up a pill called Motival that was designed to reduce anxiety, he was still drinking heavily. The band, one of the biggest in the world at the time, had finished a European tour that summer and the prospect of rehearsing for their upcoming American tour had reduced Bonham to a bag of nerves. A home-loving boy, he was not enjoying his fame and would rather have taken a few months off to deal with his demons. So he ordered King to stop off at a pub for breakfast and there he polished off his ham roll with four quadruple vodkas with orange. By the time he arrived at the Old Mill House, the property Page had bought from the actor Michael Caine for £900,000 earlier that year, Bonham was still in a state of high anxiety and got through the day by knocking back more and more vodka until it got to the point where he could simply no longer play. He was put to bed by one of the band’s roadies, a man who had performed the task many times before. He carefully placed him on his side and propped him up on pillows. Next day, when Bonham hadn’t emerged for lunch, bassist John Paul Jones and a member of the entourage went to rouse him, only to find him unresponsive – he had choked to death on his own vomit. The coroner would later record that Bonham had the equivalent of 32 measures of vodka in his system when he died. Two months later, Led Zeppelin – who had been to the 1970s what The Beatles had been to the 1960s – decided to call it a day. It may well have been a decision that saved their lives. Because, as the author of a new book on the band puts it, they “wrote the rulebook for on-the-road excess”. The band’s backstage life was once described by Page as an alcoholfuelled “stag party”. Drinking and drug-taking sessions could go on for days and all too often resulted in trashed hotel rooms. What supporters of the #MeToo movement, or indeed most reasonable human beings, would make of the band’s behaviour doesn’t bear thinking about. On one occasion Page stripped naked, was covered with whipped cream, put on a room-service trolley and wheeled into a room to be served up to a bunch of teenage girls. The guitarist, who tried to wean himself off heroin on a Caribbean island by drinking white rum, travelled with a collection of whips to be used, he said, on groupies he found to be “teasing and acting haughty”, adding that “if you humiliate them a bit, they tend to come on all right after that”. The rampant misogyny meant at times that no woman was safe. A young female journalist from Life magazine, Ellen Sander, joined their 1969 tour and reported being attacked by two members of the group when she went into a dressing room to say goodbye. She fought them off but their intent was underlined by a torn dress. Like most women in those days she didn’t report them, even though Page later described her account as “not a false picture”. He added, as if by way of an excuse, that he always got “very edgy” before going on stage and that there were “different ways of releasing that surplus adrenaline”. 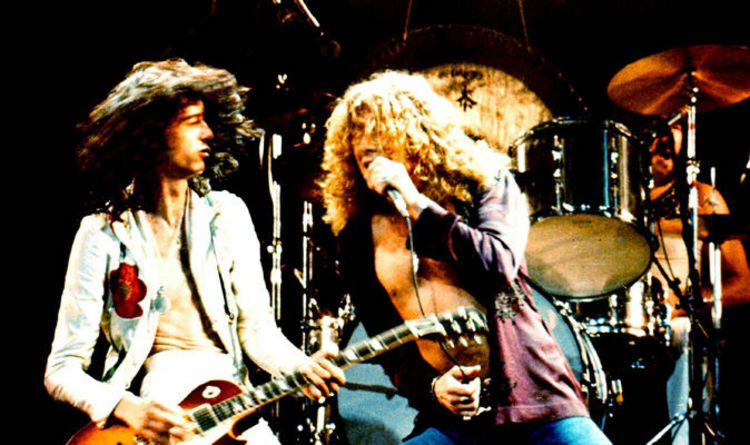 Despite their off-stage antics, Led Zeppelin sold an estimated 300 million albums and Stairway To Heaven remains one of the definitive rock songs of all time – and a rite of passage for aspiring guitarists. There have been one-off reunions over the years, with Bonham’s son Jason taking over on drums. The most recent one, in 2007 at the O2 in London for a tribute to Atlantic Records’ co-founder Ahmet Ertegun, was a triumph and revived the hopes of millions of fans all over the world that a stadium tour would follow. According to the band’s unofficial biographer, no one dreams about that comeback more than Page, the band’s founder. Mick Wall marked the 40th anniversary of Led Zeppelin’s first album 10 years ago with an award-winning book, When Giants Walked The Earth, which detailed the band’s rise and fall. It also had the effect of ending his 20-year friendship with Page, who objected to some of the content. Ten years on, the band’s 50th anniversary is being marked with a reissue of the book, with 40,000 additional words from a variety of new sources, many of them people who had refused to talk first time round. Wall reveals that at the time of the O2 gig, all of the original band members and Jason Bonham were close to agreeing a two-year worldwide tour that could have netted them £500million. Page, he says, was particularly desperate to make it happen. Led Zep had been his creation. It was his musical genius and vision that created a winning formula and a powerhouse band that made history. But by the time their friend’s death prompted them to quit, singer Robert Plant had become the main star. And fronting the world’s biggest band wasn’t enough, he also wanted a solo career. Bonham’s death in some ways set Plant free. While the band’s former frontman developed his career, amassing a fortune estimated at £100million, it took Page four years to muster the desire to pick up his guitar again. There was a solo album, Outrider, in the late 1980s, and a couple of successful collaborations with Paul Rodgers, the singer in Free and Bad Company. But, says Wall, given his genius Page has achieved precious little since his drummer’s death. So in 2007, he hoped that he and Plant would put aside their egos, and early soundings taken by the money men were good. But two key things happened to kill the dream. Plant’s Raising Sand album with blue-grass singer Alison Krauss won a Grammy and a raft of accolades, while Page reverted to some of the bad habits Plant had loathed about him, setting up a private area backstage that no one else was allowed to enter. The singer decided he didn’t need the money enough to put up with the grief. Page was so keen not to give up the dream that he tried out Aerosmith vocalist Steven Tyler and Myles Kennedy, lead singer of Alter Bridge, as replacements in secret closed-door sessions before accepting that without Plant the dream was dead. “Led Zeppelin’s place in the history of rock is assured, and he should take pleasure from that and be very proud of it,” says Wall. “But he can’t see past it. Page is a 20th-century musical genius, an absolute icon, who created a sound and wrote songs that will always be played. Pension scams: How can you avoid being scammed? What are the warning signs?